October 4th 2013 marked the first International March for Elephants. On October 3rd and 4th 2015, the march continues. Thousands of people around the world are marching to raise awareness about the devastating impact of the ivory trade. Unchecked it will wipe out the wild elephant populations by 2025. 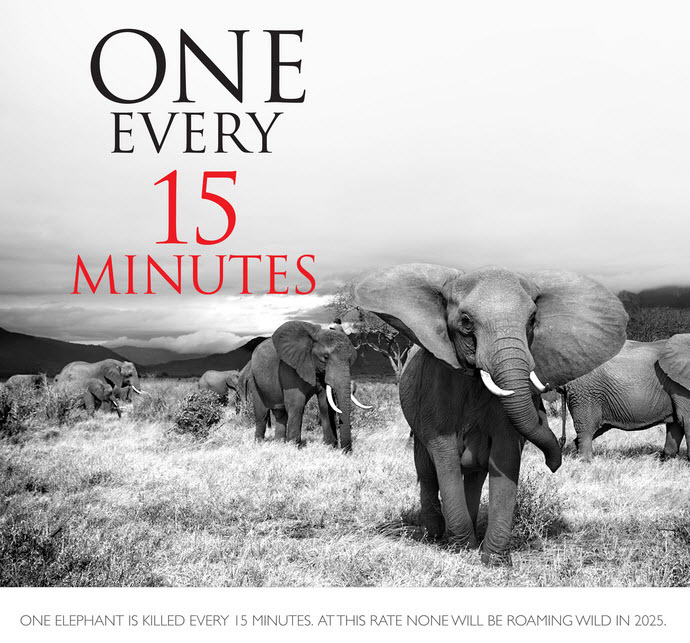 Launched in September 2012, the iworry campaign has attracted worldwide backing calling for a complete ban on the ivory trade. It’s simple. When the market for ivory disappears, the killing for it will stop. Recently, the United States and China laid the groundwork for a ban on all ivory trade. Some states, such as California, have also enacted bans on importing ivory. Progress is being made, but there’s still a long way to go if we are to save these majestic creatures from extinction. The truth is, each of us can make a difference. Supporting an organization that is actively engaged in preventing poaching — one that also rescues orphaned elephant calves that are victims of poaching — is a way those of us who are continents away can make a significant positive impact. The The David Sheldrick Wildlife Trust (DSWT) has been rescuing, rehabilitating, and returning orphaned elephants to the wild since 1977. The organization grew out of the family’s passion for Kenya and its wilderness. Today, the David Sheldrick Wildlife Trust is the most successful orphan-elephant rescue and rehabilitation program in the world. It is also pioneering conservation for wildlife and habitat protection in East Africa. Dr. Dame Daphne Sheldrick D.B.E founded the organization in 1977 to honour the memory of her late husband, David Leslie William Sheldrick MBE, the founding Warden of Tsavo East National Park. Since then, the lives they’ve saved is nothing short of astounding. It’s one thing to bang out a blog post, but my words won’t mean a thing unless I back them with action. I am happy to be fostering KAMOK and SIMOTUA, orphaned baby elephants at the David Sheldrick Wildlife Trust. Fostering is only $50.00 US dollars a year. I know people who spend more than that in a month at Starbucks. It’s rewarding to know that you’re making a difference in a huge way…in the life of an individual elephant, as well as the protection species as a whole. The following video of Kamok’s rescue demonstrates the level of care this organization extends to each and every animal in its care. 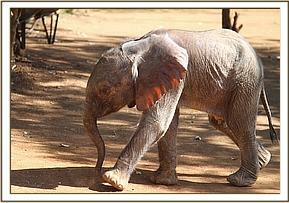 For information on how you can foster an orphaned elephant or rhino at the David Sheldrick Wildlife Trust, go here. I like to press the ‘like’ button several times with this post! Elephants are amazing creatures. I’ve fed them handfuls of bamboo in the jungles of Thailand and ridden on the back of them more than once. Those elephants were safe from slaughter; they were being well looked after by humans. I’m convinced that they’re self-aware, like we are. They are also smart. And it is a sheer crime that those in the wilderness are so badly endangered – because of humans..
it’s worse for rhinos, which I have never seen up close (nor am I keen to…) – but they are SO endangered now. And that’s a crime. I figure, just as we have a duty of care to each other, as humans – so too I think we need to have a duty of care towards the animals around us, and remember that once they’re gone…they’re gone pretty much forever. Great post – and a welcome reminder that we need to think about these things, actively…and if we don’t, we should be. Thank you for your empathy and wise words. It has been my experience too that elephants are self-aware, and that they feel as deeply as humans. I like what Gandhi had to say on this subject: “The greatness of a nation can be judged by the way its animals are treated.” I think the same is true of civilization in general. I can’t imagine a world without elephants, rhinos, or any of the other amazing species with which we share this planet. Elizabeth, I had the distinct honour of spending some informal time with an elephant while in Thailand, and I’ll never forget Djim Djim (my spelling may be wrong, but the heart is not concerned). We visited with Djim Djim every day we were there, and she would turn from newcomers to welcome us, her ‘old’ friends, and we knew she was happy that we returned. Just as language is not a barrier, neither is the ability to incorporate words. And her joy frolicking in the Indian ocean was as apparent as her deep, affectionate bond with her Mahout. So glad you posted this. I’ve shared, and will share some more. Outside my window, autumn rain is falling in preparation for winter, but my heart is back on the sunny beach with a friend. Your experience with Djim Djim is heart-warming. Elephants are as aware, sensitive, and intelligent as humans. And all elephants should be as lucky as Djim Djim, protected and cared for (even if they are in the wild). A lot of poaching happens on supposedly protected park lands. Thank you for sharing this information with friends. It’s easy to be insulated to these events when we are continents away. Raising awareness does help! Normal people coming together has always been how real change happens. Elephants are very dear to my heart. I have a strong connection with them, for some reason. Which is why I spent two weeks at elephant handling school in Arkansas back in the mid 90’s, so I could have a close, direct experience with them. It was everything I’d hoped it would be and more.